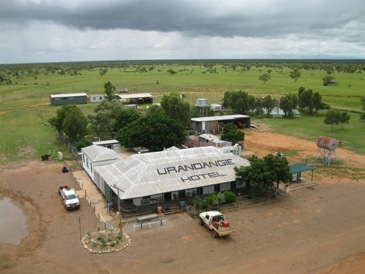 The town of Urandangie founded in 1885 on the Georgina Stock route was a popular stop for drovers before branching out to Dajarra to the railhead. Urandangie being the only place of rest for the cattle stockmen and women with water available in the Georgina river or the stock trough. Refreshments of cool ale or a rum for any drovers thirst supplies were available from the store and telephone and mail collection from the Post Office. Up to 100 mobs of cattle came through Urandangie over the droving months which were from March to December before the wet. Usually up to 1500 head of cows, bullocks, mixed sexes as well as breeders, were the 'mob'. Urandangie became a very important centre for drovers and travellers being close to the border of NT and a short cut to Alice Springs from Mount Isa and the coast. In its heyday Urandangie boasted two stores, a hotel, dance hall, Post Office, Police Station, school and several private residences. In the 1920's and in the 1930's and 40's there were over 400 people living in the area. The present Urandangie school opened in 1995 and has all modern facilities for the children who attend from kindy age to grade six. Today the Dangi Bush Resort is the place to be. See the display of early machinery such as Lister and Southern Cross engines which were used on bores to pump water and provide electricity to the bush homesteads. Visit the chinese graves, feed the animals that roam the pub grounds.